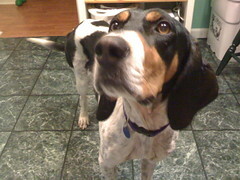 I volunteer as a foster parent for HSI and today would have started week 8 of fostercare for Lunar, the bluetick coonhound. However, Lunar has found a home today I am happy and sad together. Lunar was very nearly a keeper for me. To try and get past missing him, I created a bluetick amoeba to evolve in Spore Origins. Bitter-sweet when you are a foster mom. Sounds like any pup would be lucky to have your tlc .. hope your next one comes soon.